Thanks SO MUCH to all of you who already purchased my new Christmas CD and for all the beautiful feedback I've received. It means a lot to me to hear from you and I'm thrilled that so many of you are enjoying this collection of piano arrangements of Advent and Christmas hymns. There is still plenty of time for you to take advantage of all my Christmas gifts specials, so please check out the links below! Note: If you no longer buy CDs and get all your music electronically, just about all of my songs are available for digital download both on my website and on i-tunes. "December Recollections" is so new that it may not show up on i-tunes for another couple of days, but it will be there shortly if it's not when you check. Check out all these Christmas gift specials, and remember, I'll be happy to sign any CD or book personally. If you have a particualr person you'd like an item dedicated to, please email me and explain and I'll be glad to make your gift even more personal. AND, you'll receive a FREE copy of "December Recollections" with any order totalling $40 or more! My May, 2015 CD release "Fully Alive" would make a great gift for anyone who doesn't have it yet! 3). 5 Copies of "Wherever Love Is" book for only $47.99! 4). 5 of ANY of my CDs for $47.99! So many of you told me how much you enjoyed reading the story behind the piano featured in my new CD that I figured I'd include it once again here in case you missed it the first time. A short version of this story is also on the liner notes of the CD. "December Recollections" isa collection of contemplative piano instrumental arrangements of a number of my favorite Advent Hymns and Christmas Carols. What's most special about this new recording is that the arrangements were composed and recorded on a Steinway baby grand piano that has been in my family since about 1920. My maternal grandfather gave this piano as a gift to my grandmother when they were first married. My grandmother loved to sing and had a beautiful soprano voice. But she was shy and wouldn't sing in front of people. My grandfather found out about a vocal contest and told my grandmother that if she would just enter the contest and participate that he would buy her a piano. She entered and won the grand prize, and that's how this piano came into my family's life. 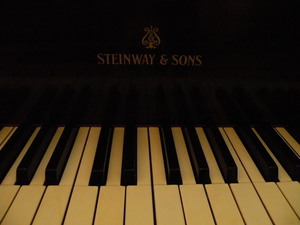 I messed around with this piano often as a child on visits to my grandparents' house, and I have fond memories of my grandmother encouraging me to play when she realized I had a natural musical gift. My mother inherited the piano and took great care of it for years even though she did not play piano herself. She loved the sound of it so much that she had a player piano mechanism installed on it so that she could hear the instrument over the years. Not long before my mother died, she had it rebuilt and shipped to me as a gift. Unfortunately the piano was damaged in the rebuilding process, and when I received it I was informed that it would never be worthy of recording for a number of reasons. But I found a good piano technician and have had some work done on it bit by bit over the years. I had it worked on again in October, 2015, and decided that it was finally good enough to give it a shot in the studio. I put a couple of good mics on it and sure enough, it sounded great. Oh it's not perfect. The main issue is that certain keys still have a hard time staying in tune, and a few keys have issues with sustain. At times it reminds me of an old "saloon piano" in a western movie, and those of you with good musical ears will hear these "struggles" now and then. In fact you can listen to clips of the songs on my website to get a feel for what I'm referring to and make sure you know what you're buying! But something about this old piano just spoke to my heart and called to me from beyond it's imperfections, and as I wrote in the liner notes, "sometimes what's imperfect and raw has a sense of soul to it that mere perfection can't touch. This piano is like that for me." I got inspired to see if I could come up with arrangements of some Advent and Christmas hymns, and "December Recollections" spilled out in about a week's time. I wanted you to know about this piano and to understand some of the heart strings connected to this project for me. Every time I listen to it I'm reminded of that piano, my grandparents, my mother, and all the Holidays and beautiful moments we shared throughout the years. I wish you all a beautiful Advent, Christmas, or other Holiday experience this year. It would mean a lot to me if some of these arrangements find their way into your homes as background music for your family, or as a soundtrack for quiet listening and meditation and reflection on the meaning of Advent, Christmas, and the amazing gift of Christ's coming into this world in Jesus of Nazareth. I'll look forward to being in touch, and I do hope you'll choose to give some of my music and books to your loved ones this year. Thanks so much for all your support and love, and may the Light and Love of the Divine be powerfully present to, within, and through us all.